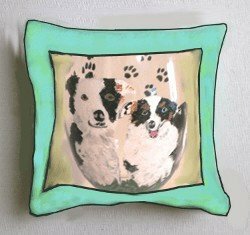 Dachshund hand painted glasses by Clearly Susan show off this unique dog breed that is short-legged, long-bodied belonging to the hound family. Notice how your little Dachshund is a burrower in the yard or under the covers? He is following his natural instinct as he was bred to scent and flush out badgers and other burrow dwelling animals. Clearly Susan's hand painted Dachshund glasses show the true stubborn temperment of this fiesty little dog. An owner of dachshunds once told me that they can't be trained and shouldn't be. She said that she would rather train a striped zebra to balance a ball on his nose than induce a dachshund to heed her slightest command. "He even disobeys me when I instruct him in something he wants to do." According to the AKC, the dachshund continues to remain one of the top 10 dog breeds in the United States of America. We also hand paint platters and Christmas ornaments. 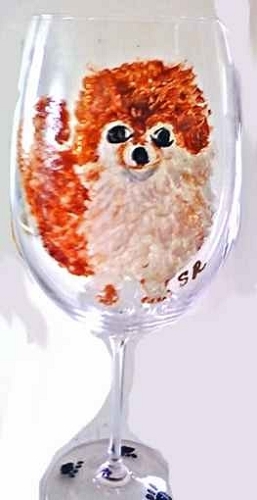 Susan, You did an amazing job hand-painting our sweetheart Frankie on a wine glass. All of my friends love it! I am glad you keep me updated via e-mail as you were making this masterpiece and you also would advise me when the glass would be shipped out to my location. I will definitely will refer my friends and family to your website for excellent hand crafted items.